A 19 inch rack is a recognised international standardized frame or enclosure for mounting multiple equipment modules. A “U” or multiples of is the size adopted by manufacturers for outboard hardware equipment like compressors, noise gates, effects processors., cd players, amplifiers. Each module has a front panel that is 19 inches (approx 483mm) wide, including edges or ears that protrude on each side which allow the module to be fastened to the rack frame with screws. The depth of the unit will vary. The standard size for 1u .is 19″ x 1.75″ /482.6mm x 44.4mm. If you add a door to a rack it becomes a cabinet. 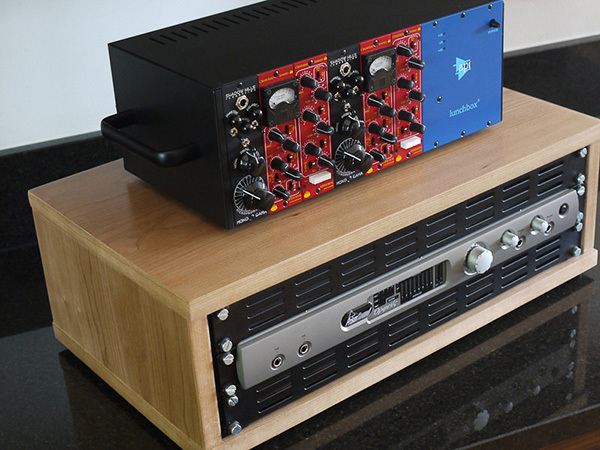 The majority of equipment in a studio can be supported by the front rack strips only, very heavy items or if you intend to move racks around may require additional support, we can of course help and advise on this. If you wish for further advice about 19″ racking in general please phone, we shall do our best to help.